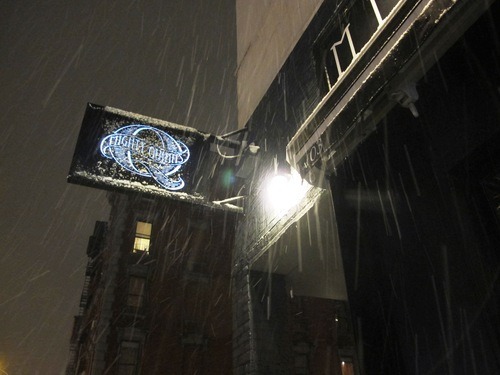 In the middle of NYC’s East Village, there lies an honest-to-goodness barbecue joint that cooks over wood – breathe in the glorious smoke when you enter and check the stack on the shelves as you wait to order – and on a snowy winter night after (several) drinks with friends, Mighty Quinn’s was the perfect suggestion. 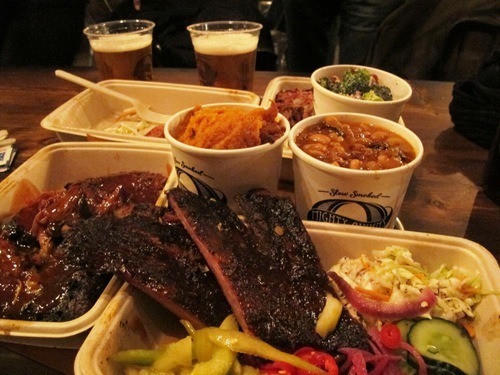 I first heard of Mighty Quinn’s when it was named one of Steven Raichlen’s 10 Best BBQ & Grill Restaurants of 2013 (fun fact from that article: it is co-run by a former Wallflowers drummer), so naturally when my wife booked us a trip to NYC for my birthday I knew I wanted to get there.. 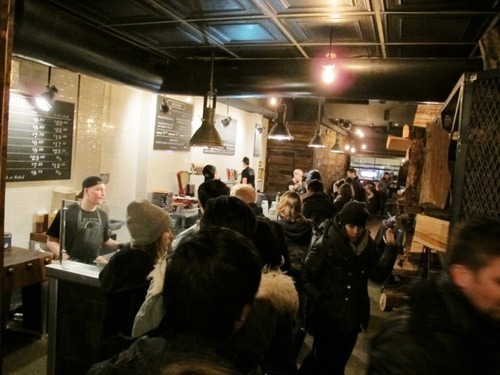 Mighty Quinn’s has a fast casual set up and after entering the restaurant, patrons line up at the end of the narrow-ish 65 seat room. From there you work your way down the cafeteria-style line, ordering meat first before sides and finally beer (being able to order growlers is a stroke of genius). 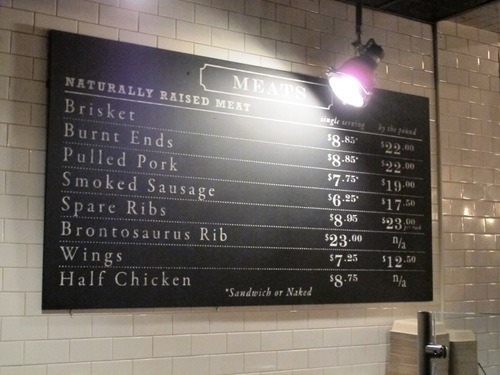 There are plenty of meat options to choose from and in addition to what we ordered you also have the choice of burnt ends, a brontosaurus rib (at nearly 2 lbs, it is recommended for two), wings, or a half chicken. The pork has a nice bark and is pulled freshly in front of you as you order but is then unfortunately automatically doused with their house sauce which is vinegar-based but is sweeter than nearly any sauce you’d find in North Carolina. I liked the pork a lot but would definitely order it with sauce on the side next time. 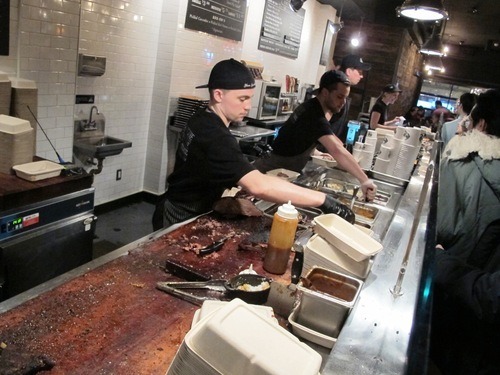 The brisket is sliced to order as well, and as you would expect you can get lean, fatty, or both. An order of both was a little more fatty than I would expect but the brisket had a good tug to it and a nice peppery bark. The sausage was spicy, had a nice snap, and was really good. The spare ribs were tender, didn’t fall away too easily from the bone, and had good flavor. 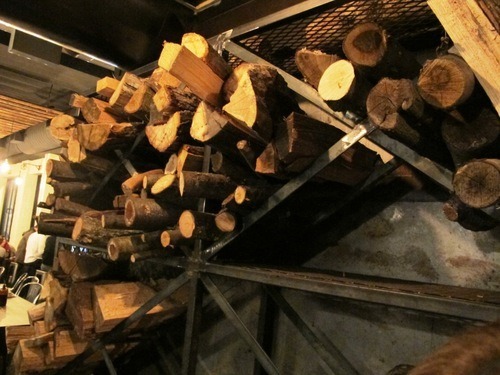 All of the meat was really well smoked and moist and I would recommend any of what we had. Each meat order includes your choice of a picked add-on of either cucumber, celery, red onions, or chiles. 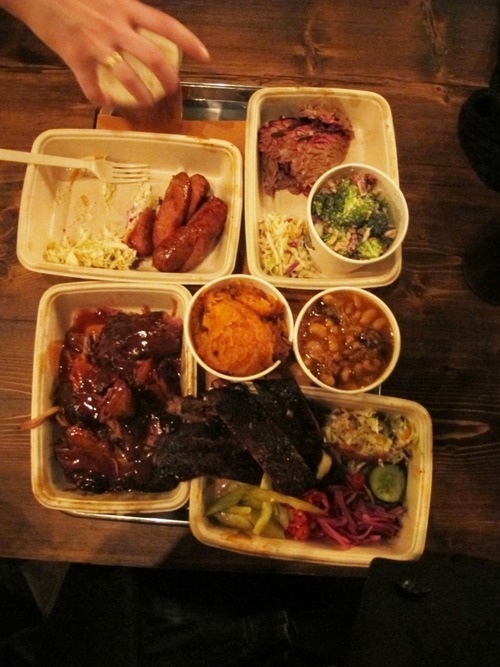 The sides generally kept pace with the meat. While not traditional barbecue sides, the sweet potato casserole with maple and pecans was outstanding and the broccoli slaw was actually quite good. The baked beans were solid and you may even get to see the carvers adding burnt ends to the beans after slicing brisket orders. Apparently the edamame and pea salad is really good, but we didn’t choose that one (seriously, they don’t really do traditional barbecue sides here). 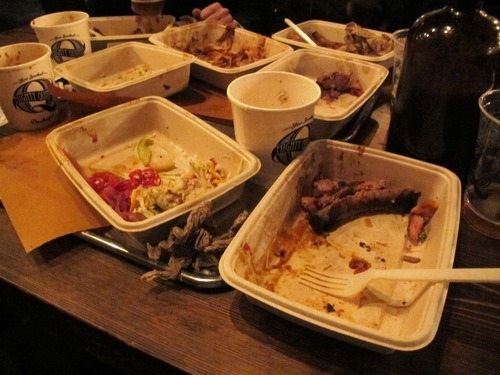 I had a great experience at Mighty Quinn’s. 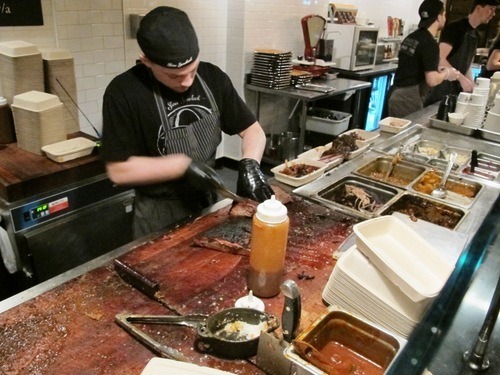 While it bills itself a “Texalina” joint combining the barbecue traditions of both Texas and North Carolina, after visiting I really consider it to be more of a Texas-style joint (as most NYC barbecue restaurants seem to be). Nevertheless, I can’t recommend it enough if you are looking for proper barbecue in the city without having to make the trek out to the Brooklyn joints.